A central feature of Mariane Hedegaard’s approach to developmental research is the need to conceptualise children as whole persons, acting in meaningful practices. This wholistic perspective is central in cultural-historical theory. Some historical and conceptual background for this perspective is explicated, especially in relation to child development. Main topics are (a) the relation between appearance and essence, which is illustrated with the concept of social situation of development and (b) ‘analysis into units’, which is widely misunderstood in the secondary literature. 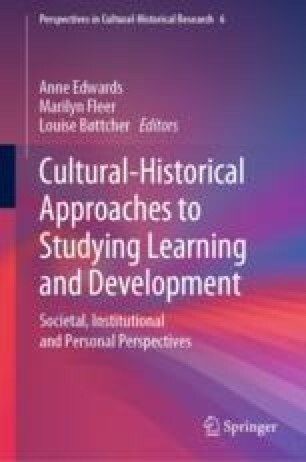 Methodological implications for the cultural-historical theory of development are outlined, emphasising the role and relevance of a personality concept. Bakhurst, D. J. (1986). Thought, speech and the genesis of meaning: On the 50th anniversary of Vygotsky’s Myslenie i rec. Studies in Soviet Thought, 31, 103–129. https://doi.org/10.1007/BF01046370. Bespalov, B. I. (2015). Logical-semantic analysis and the development of L. S. Vygotsky’s ideas about “units” and “elements” of psychological systems. Journal of Russian & East European Psychology, 52(5–6), 13–44. https://doi.org/10.1080/10610405.2015.1199159 (Original work published 2014). Bozhovich, L. I. (1977). The concept of the cultural-historical development of the mind and its prospects. Soviet Psychology, 16(1), 5–22. https://doi.org/10.2753/rpo1061-040516015. Bozhovich, L. I. (2004). Developmental phases of personality formation in childhood (I). Journal of Russian & East European Psychology, 42(4), 35–54. https://doi.org/10.1080/10610405.2004.11059224 (Original work published 1978). Bozhovich, L. I. (2009). The struggle for concrete psychology and the integrated study of personality. Journal of Russian & East European Psychology, 47(4), 28–58. https://doi.org/10.2753/rpo1061-0405470402 (Original work published 1968). Chaiklin, S. (2003). The zone of proximal development in Vygotsky’s analysis of learning and instruction. In A. Kozulin, B. Gindis, V. Ageyev, & S. M. Miller (Eds. ), Vygotsky’s educational theory in cultural context (pp. 39–64). Cambridge: Cambridge University Press. https://doi.org/10.1017/CBO9780511840975.004. Gillespie, A., & Zittoun, T. (2010). Using resources: Conceptualizing the mediation and reflective use of tools and signs. Culture & Psychology, 16, 37–62. https://doi.org/10.1177/1354067x09344888. Vygotsky, L. S. (1998c). The problem of age (M. J. Hall, Trans.). In R. W. Rieber (Ed. ), The collected works of L. S. Vygotsky. (Vol. 5). Child psychology (pp. 187–205). New York: Plenum. https://doi.org/10.1007/978-1-4615-5401-1_6 (Original work written ca. 1933).